As university students hit the books and study for exams, a new puppy program at Ryerson University looks to help students fight stress with the help of a few furry friends. Ryerson’s Centre for Student Development and Counselling has set-up a special puppy room on campus where students can come to take their minds off work and cuddle with therapy dogs provided by the St. John’s Ambulance and Therapeutic Paws of Canada. Bronwyn Dickson, a counselor at Ryerson, says the puppy room gives students a chance to de-stress during the hectic weeks of exam time. “The puppy room is just a unique place on campus where there’s laughter and smiles and it’s just a place where students can some to relax and take a break from all the stressors that are associated with this time of year,” Dickson said. “We have certified therapy dogs that are brought in by their owners, who are their handlers,” she said. 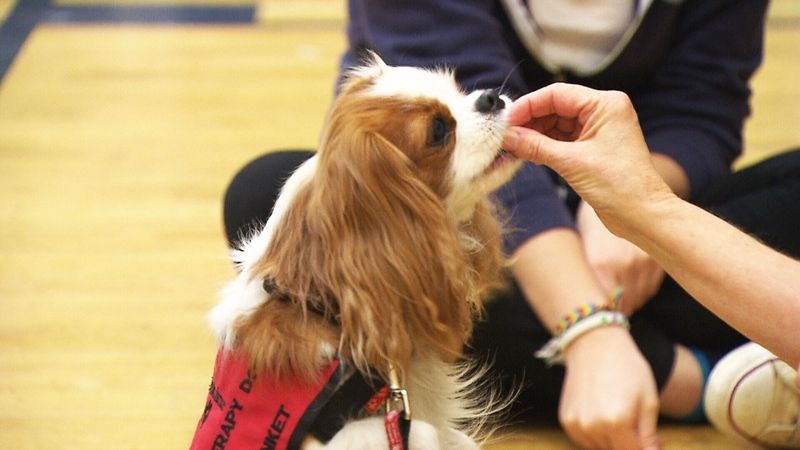 Ryerson launched the program in October as part of Mental Health Awareness Week and had more than 500 students come and visit the dogs. Jessica, a math student at Ryerson, says visiting the puppies was an exciting distraction from her hectic study schedule. “Exams are in like a week, so I figured let's go get some relaxation with the puppies because I don't have one at home,” she said. “It's amazing what they do for you, they just make you feel so relaxed. They calm all the nerves for exams, it’s great,” said contemporary science student Jessie. Studies have shown that interacting with pets when stressed can reduce tension and lower blood pressure and breathing rates. 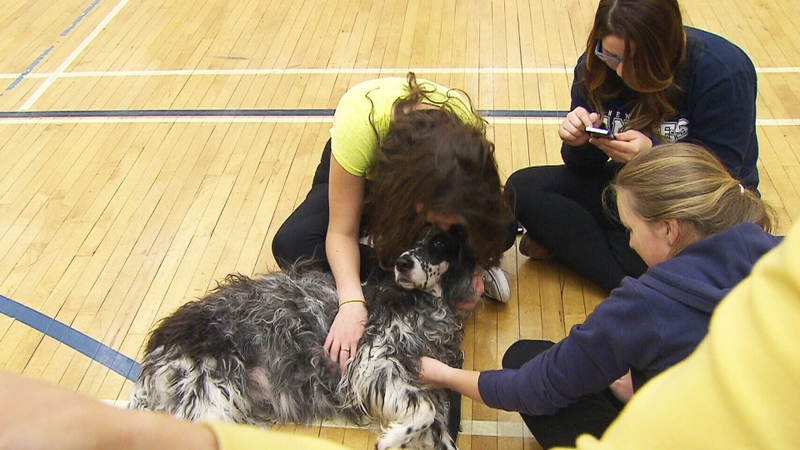 Ryerson isn’t the first school to offer canine support to students as schools across Canada, including the University of Western Ontario, University of Ottawa and Dalhousie University, have all set-up successful dog therapy programs for students in recent years. Andrea Moon, an education strategist at Ryerson, says students have been flocking her Learning Strategy Office to ask for other exam advice. She says students should avoid cramming and pulling all-nighters, banish smartphones and get a good night’s rest. “Remaining positive. So thinking about the process instead of the outcome and also keeping perspective, so while a test or exam may be a measure of what you know of the material up until now, it's not necessarily a reflection of a student's potential or intelligence,” Moon added. Other tips include taking regular study breaks and creating a structured study plan. With a report from CTV Toronto’s Pauline Chan. Therapy dog at Ryerson University. 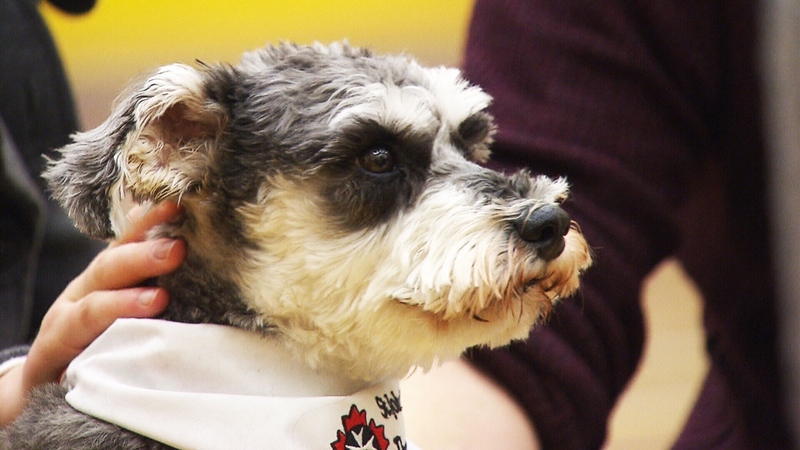 Ryerson students cuddle with a therapy dog as they try to relieve stress during exam time.